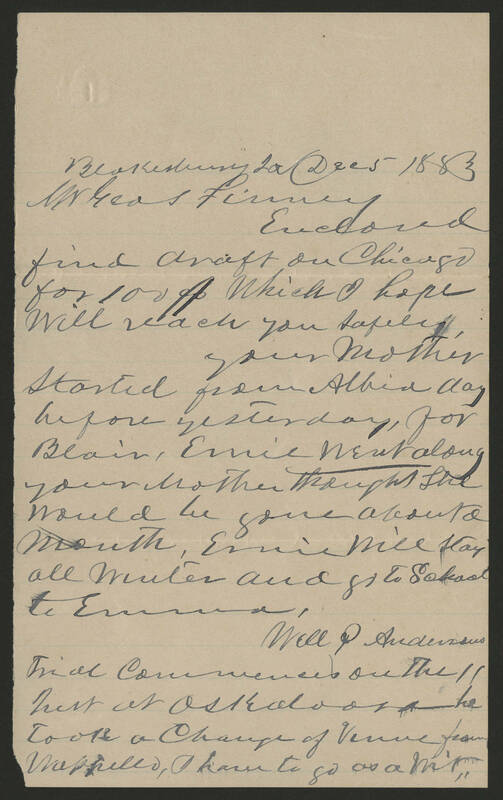 Blakesburg Ia Dec 5 1883 Mr Geo S Finney Enclosed find draft on Chicago for 100$ which I hope will reach you safely. your Mother started from Albia day before yesterday, for Blair, Ernie when along your mother thought she would be gone about a month, Ernie will stay all winter and go to School to Emma. Well P Andersons trial Commences on the 11 Inst at Oskaloosa he took a change of Venue from Wappello, I have to go as a Wit.